This book provides an in-depth analysis of how mobilization and legitimation for war are made possible, with a focus on Russia's conflict with Chechnya. Through which processes do leaders and their publics come to define and accept certain conflicts as difficult to engage in, and others as logical, even necessary? Drawing on a detailed study of changes in Russia’s approach to Chechnya, this book argues that ‘re-phrasing’ Chechnya as a terrorist threat in 1999 was essential to making the use of violence acceptable to the Russian public. The book refutes popular explanations that see Russian war-making as determined and grounded in a sole, authoritarian leader. 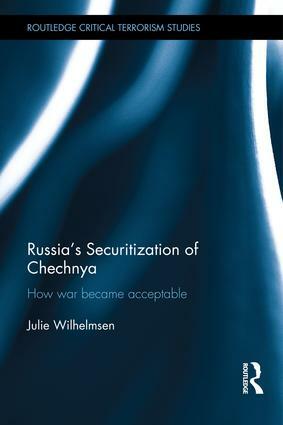 Close study of the statements and texts of Duma representatives, experts and journalists before and during the war demonstrates how the Second Chechen War was made a ‘legitimate’ undertaking through the efforts of many. A post-structuralist reinterpretation of securitization theory guides and structures the book, with discourse theory and method employed as a means to uncover the social processes that make war acceptable. More generally, the book provides a framework for understanding the broad social processes that underpin legitimized war-making. Julie Wilhelmsen is Senior Research Fellow at the Norwegian Institute of International Affairs (NUPI), Norway and has a PhD in political science from the University of Oslo. She is co-editor of Russia's Encounter with Globalization: Actors, Processes and Critical Moments (2011). This book series will publish rigorous and innovative studies on all aspects of terrorism, counter-terrorism and state terror. It seeks to advance a new generation of thinking on traditional subjects, investigate topics frequently overlooked in orthodox accounts of terrorism and to apply knowledge from disciplines beyond International Relations and Security Studies. Books in this series will typically adopt approaches informed by critical-normative theory, post-positivist methodologies and non-Western perspectives, as well as rigorous and reflective orthodox terrorism studies.